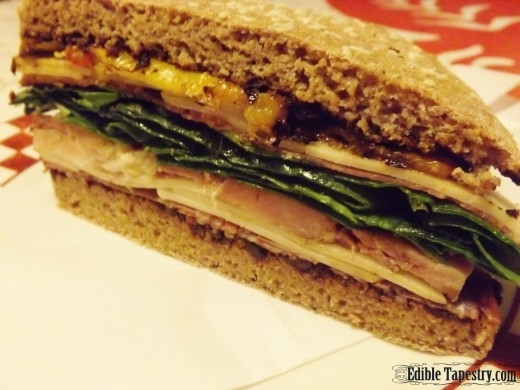 I love a big, fat meat and cheese sandwich. This one only happened because after a crazy day of being snowed in, losing power, having power restored, the sun coming out, and a snow plow curing us of cabin fever, we took a ride to rejoin the general population after days of being blissfully snowed in. I knew it was Fat Tuesday, the day I like to make something festive for my family in honor of Mardi Gras, and I really wanted a muffuletta sandwich, but because I’d spent the Valentine’s/President’s Day weekend prepping for Winter Storm Neptune and its aftermath by filling the freezer with as much cooked food as I reasonably could, I just hadn’t thought far enough ahead to Fat Tuesday. Last year I made a king cake. One year I made Mock Turtle Soup. I don’t know why it’s so much fun to make Mardi Gras food when we’ve never been to New Orleans. I guess we just take any excuse in this family to celebrate with good food. 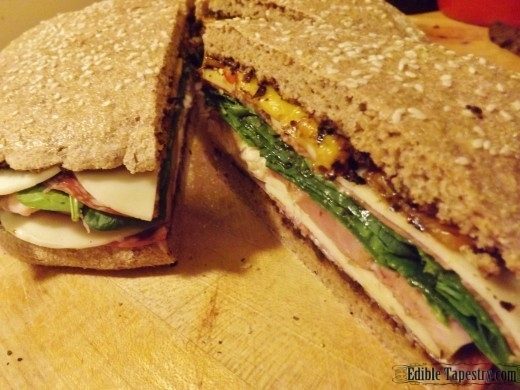 That impromptu trip into town gave me just enough time to grab the ingredients I didn’t already have to make my muffuletta. 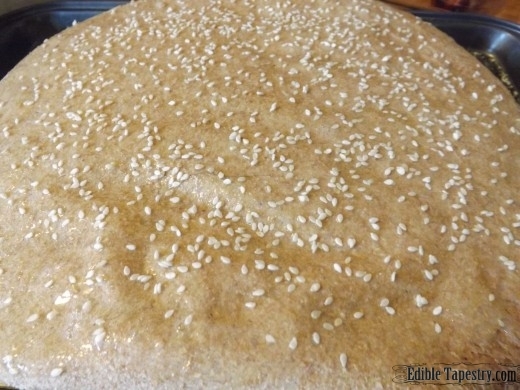 Because I like to mix things up, I made a round loaf of whole wheat bread, just thrown together with yeast, salt, flour, and water, and sprinkled it with sesame seeds before baking, rather than using a traditional white mufuletta bread. We have been eating too many “whites” lately and really need to get back on track. 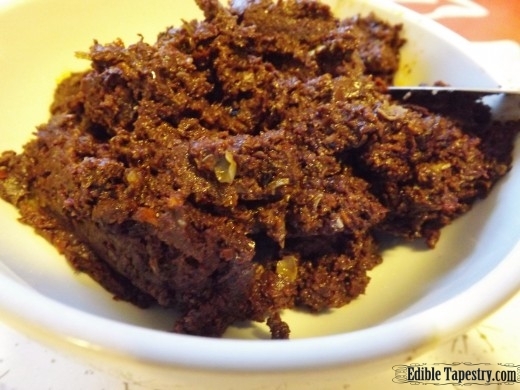 Then I added a bunch of sun dried tomatoes to my olives and capers when it came time to make the tapenade that is traditionally spread on a mufuletta sandwich. 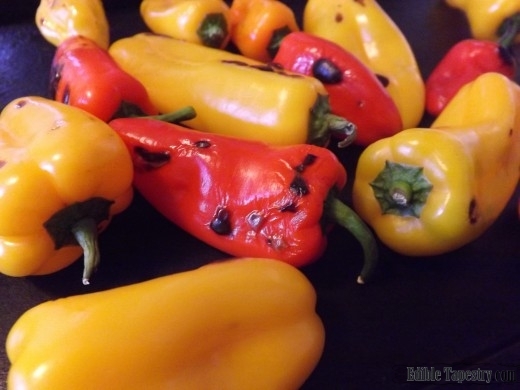 Sweet, little mini peppers were just too tempting at the store today, so I bought a bag of them and roasted them up for the perfect top layer of my ginormous sandwich. 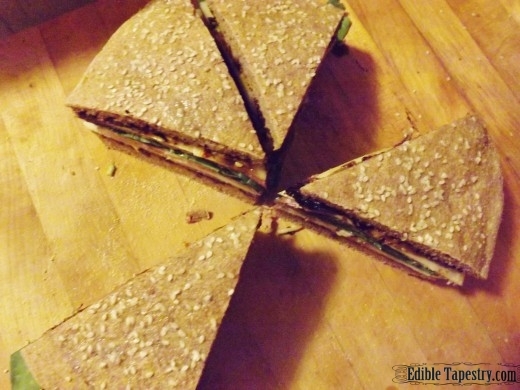 In the middle, over a mountain of baby spinach leaves, I drizzled balsamic vinegar and extra virgin olive oil, along with a sprinkle of salt and pepper and dried basil from last year’s herb garden stash, to add moisture and flavor to the sandwich, . 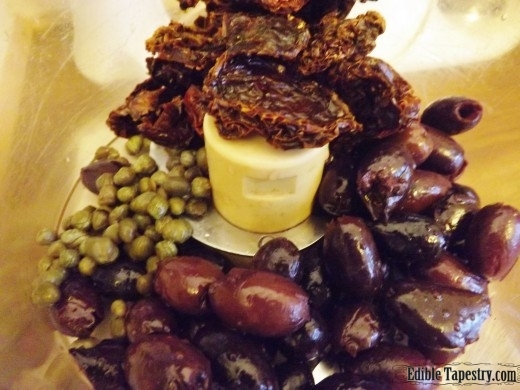 Place the olives, caper, and sun dried tomatoes in the bowl of a processor. Puree. Drizzle in olive oil. Cut the round of bread in half, horizontally. 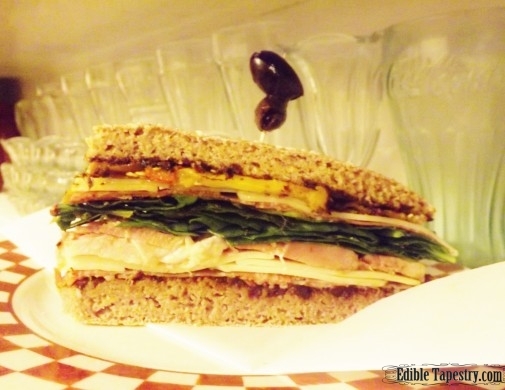 Spread each half with the finished tapenade. 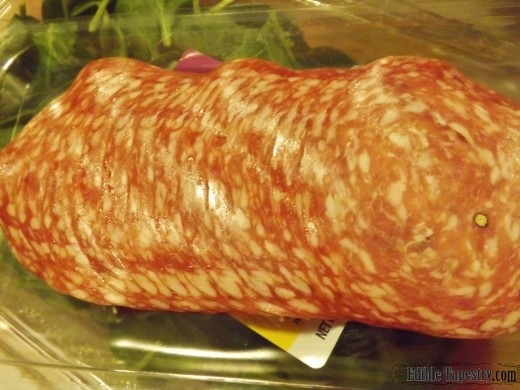 Layer on half the salami, then half the provolone, then ham. Lay spinach over the ham and sprinkle it with vinegar, oil, salt, pepper, and basil. 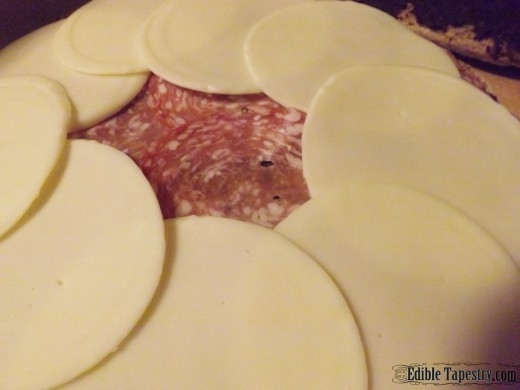 Layer on the remaining salami and provolone. 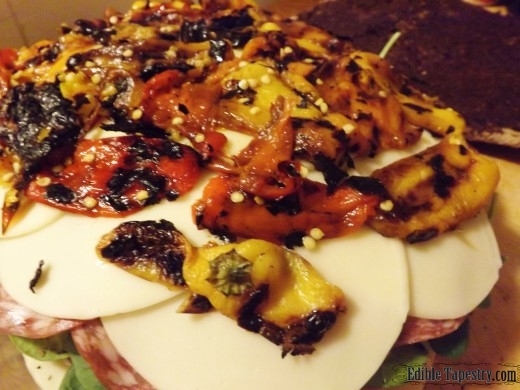 Top with the roasted peppers. 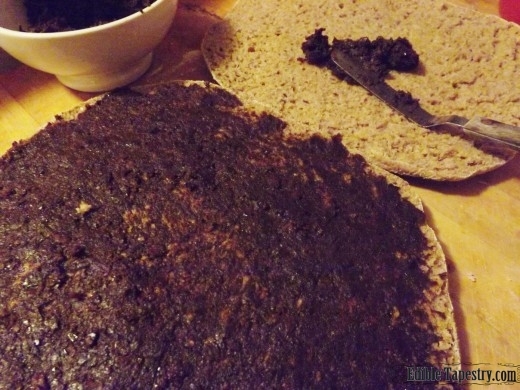 Cover with the top half of bread spread with tapenade. Cut into wedges.